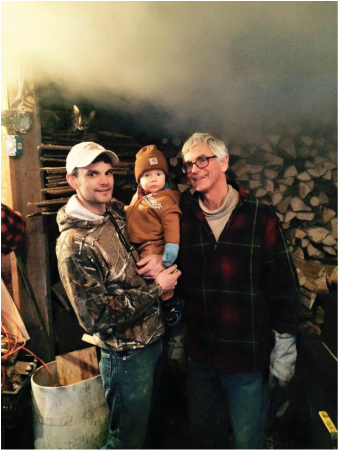 Gideon, Wyatt and Ron Frisbee pause for a picture beneath the steam from the boiling maple sap. For generations, the Frisbee Family has been collecting sap from their hillside sugarbush on the hillside, and boiling it the old fashioned way--in a wood fired evaporator. While it's never been proven that different evaporation methods impart a different flavor to the maple syrup, many of our customers swear that, like a fine wine, our syrup has notes of smoky chocolate. Pints ($12,) Quarts ($20,) Gallons ($55,) and Half Gallons ($34,) are available for purchase, right from the farm--and also by mail. Call (607) 746-9514 to place an order, or submit your request on our CONTACT page. Woodlots on the farm are managed for maple, wildlife, livestock, and timber. A byproduct of timber stand improvement is firewood, which can be purchased by the face cord. Farm owner Ron Frisbee can produce rough-cut lumber from a variety of species, to provided dimensions. Call or email us at RiverdaleFarm@yahoo.com for information.